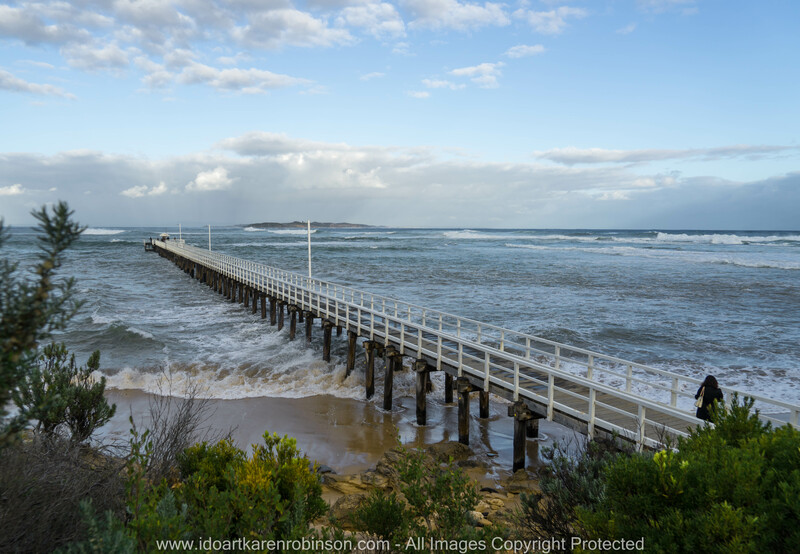 Lonsdale, Victoria – Australia ‘Seascape and Sunset’ photographs by ©Karen Robinson http://www.idoartkarenrobinson.com April 2017. Comments: Late one afternoon my hubby and I decided to visit this region to capture seascape and sunset photographs. It was an exhilarating experience with lots of walking involved and the sea breeze rushing against our faces. 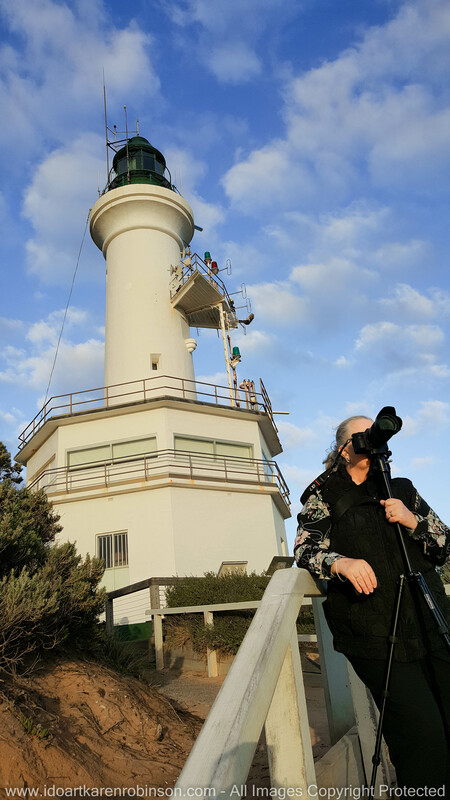 The sight of the sun slipping away for the day was beautiful to watch and capture – written by ©Karen Robinson NB: My dear husband took this photo of me using my Samsung Galaxy 6 Mobile Phone as I was photographing the sunset from Point Lonsdale Lighthouse. The aim of this photography adventure was to capture seascape and sunset scenes around Point Lonsdale region, Victoria – Australia; a small coastal town not far from Geelong where I had worked earlier on this particular day. We arrived late afternoon at Point Lonsdale front-beach, which is a small beach located at the mouth of Port Phillip Bay. Here I took photographs of the beach’s stone sea-wall, wide ocean views and of white crashing surf breaks, seaside bush vegetation and of local surfers taking advantage of high-tide waves. Then we moved on – towards the Point Lonsdale Pier where I was able to capture varying shots of the pier while the tide was coming in towards the coastline. Once the ‘golden hour’ arrived I settled into taking photographs of shoreline rocks and then glorious sunset photographs looking out and across to Barwon Heads. 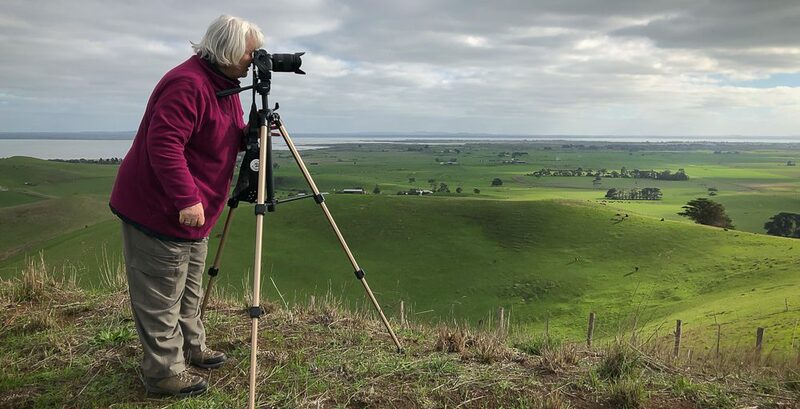 Once more this occasion offered myself a wonderful opportunity to take photographs of our local region but also gave me precious time to spend with my husband – a win-win for me! “Point Lonsdale is a coastal township on the Bellarine Peninsula. The Point Lonsdale section of the Port Phillip Heads Marine National park is located between Queenscliff and the western side of the Port Phillip entrance. 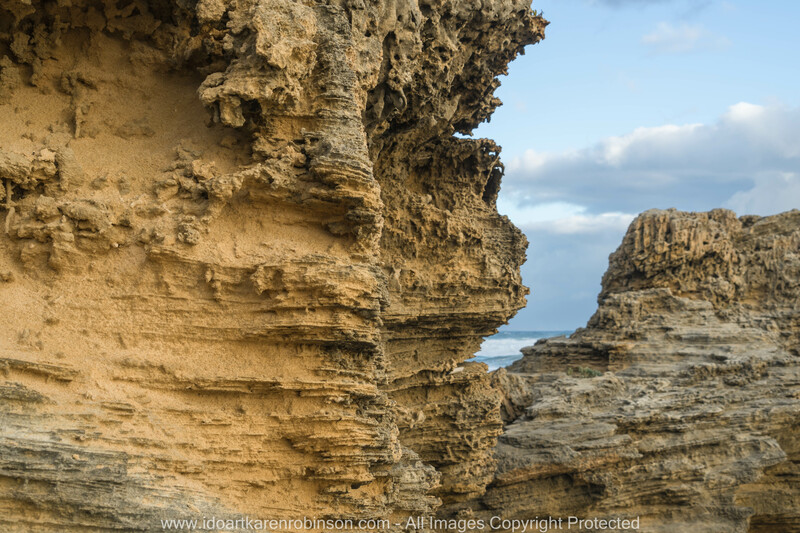 Many of the rocks that make up the reefs as well as rocks and cliffs above the water are made of ancient dune limestone or calcarenite. This readily weathered rock is made of sand grains that have been cemented together by the high amounts of calcium carbonate derived from shells. The outer limits of the park at Point Lonsdale can be subject to strong currents when water is moving in and out of The Heads. The intertidal reef is a great place for beginner and advanced snorkellers, as well as divers, to explore and experience a diverse array of Victoria’s marine life. Visitors can find a channel through Lonsdale Reef, around 20m wide and 2-4m deep, which contains a small forest of Giant Kelp. This was created by fishermen seeking an easier entrance to the bay through the Rip in their small fishing boats. Snorkelling around Point Lonsdale jetty and nearby reef is very popular in the summer months. The deeper waters of the area contain fascinating structures including deep water cliffs, caverns, rocky reef walls, sponge gardens and kelp beds. The popular dive site, Lonsdale Wall, is composed of a series of ledges which mark the edge of the historical course of the Yarra River. Starting at 15m deep, the ledges drop to 90m and extend for up to 1km. Vertical walls, sheltered caves, ledges and overhangs support dazzling sponge gardens, over 43 species of fish and encrusting algae. Other creatures include corals, anemones, gorgonians, hydroids and sea tulips. During this seascape photography exercise – I used my new compact system camera a Sony A7 Mark II – Full Frame with a Sony A FE24-240mm F3.5-6.3 OSS Lense. For some of the shots I used the camera hand-held, and for others, I used the camera mounted on a tripod with a remote timer. This was the second time I had used this new camera and lense. I am still getting use to understanding its abilities. It was such a pleasure though to use, and good for someone like myself trying to learn to be a better photographer! I also used my Samsung Galaxy S6 mobile phone for quick spontaneous photographs and gain GPS location readings. Lonsdale, Victoria – Australia ‘Seascape and Sunset’ photographed by ©Karen Robinson http://www.idoartkarenrobinson.com April 2017. Comments: Late in the afternoon my hubby and I decided to visit region to capture seascape and sunset photos. It was an exhilarating experience with lots of walking involved and the sea breeze rushing against our faces. 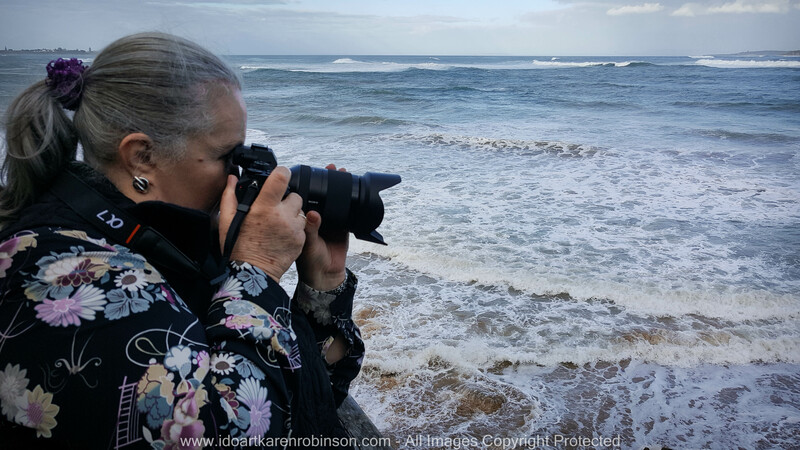 The sight of the sun slipping away for the day was beautiful to watch and capture – written by ©Karen Robinson NB: My dear husband took this photo of me – he used my Samsung Galaxy 6 Mobile Phone as I was photographing the surf at Point Lonsdale Lighthouse with my Sony A7 Mark II – Full Frame Camera and Lense Sony A FE24-240mm F3.5-6.3 OSS. On my return home, I downloaded all the photographs into Adobe Lightroom 6. I developed a small selection of photographs. During the process of developing them I was able to see what I needed to address during my next photographic adventure. Please find both above and below, the best of what I took during this particular late afternoon at Point Lonsdale. This entry was posted in Photography and tagged Adobe Lightroom 6, Ancient Dune Limestone, Beach, Blue Skies, idoartkarenrobinson, Point Lonsdale, Point Lonsdale Lighthouse, Point Lonsdale Pier, Port Phillip Bay, Samsung Galaxy S6 Mobile Phone, Seascape Photography, Sony A FE24-240mm F3.5-6.3 oss Lense, Sony A7 Mark II Camera, Sunsets by idoartkarenrobinson. Bookmark the permalink.